This post has been a long time coming. I’m trying to be more intentional about my blog, so I keep struggling to think of topics to write about, which means long delays in between posts. But I will try to do better! 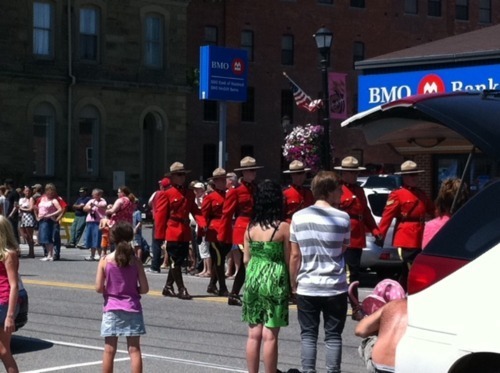 I have more photos of Canada to accompany this post (I tried to pick the most quintessentially Canadian one to upload individually, seen above featuring mounties), but I was going to upload them to Facebook first. iPhoto and Facebook are were not playing nicely last week so that was a fail. But Laura, you may ask, why don’t you just upload them this week? Well, I’ll tell you, blog reader. Sunday night my computer took a little bit of a bath. A cup of water was sitting on our coffee table—as was my laptop— and it got knocked it over. Alas. Apparently the one thing you do not do when you spill water on your computer is attempt to turn it on after you dry it off with a dish towel. Nor do you plug it into the charger when it fails to turn on, thinking it may have just run out of battery. This will only result in a static-like noise projecting loudly from your speakers and a malfunctioning trackpad. Also you will then discover that the Apple website says at the worst thing you can do after spilling liquid on your computer is attempt to run power to it. So there’s that. So now my macbook is at the Apple doctor where they will “take a look at it” in 2-3 days and get back to us. Sigh. I just hope I don’t lose anything, seeing as I have failed to set up Time Machine since I got my new computer after we got married. I am particularly concerned about the fact that I have a story I’ve been writing for a contest sitting on that thing, which I have started over on about 3 times. (Turns out the 3rd time really IS a charm. [Insert sad trombone here.]) We think it will not be a hard drive-related problem, but still keeping fingers crossed. 1. Lumberjack competition. When in Rome, right? 2. International festival weekend [My grandparents’ town is right on the border of Maine. Also I love all things street fair. Particularly the lemonade.] 3. Fish & chips from a tiny takeout place. [I am not a huge seafood fan but this stuff was legit.] 4. Scenery, which I will post pictures of as soon as my computer makes its triumphant return. 5. Chocolate. [My grandparents’ town is also “Canada’s Chocolate Town” due to the fact that there is a chocolate factory located there. Chocolate-fest was wrapping up that weekend. Win.] 6. Mrs. Dunster’s Donuts. Seriously, these things are amazing and I am disappointed that no one in the States has decided to get in on that yet. The ones we love are whole wheat (aka totally healthy right? ), cinnamon & sugar, and they come in a bag. (They’re more like giant donut holes rather than glazed O shapes.) We still have some in our freezer. I think. We had a great trip even though it was super short. We left on Friday & came back on Monday. It was fun to show Craig around and to see everything from a new perspective since I hadn’t been there since high school. Next time I will have a more purposeful post. I promise. Also maybe a video of Lumberjack Roger hurling an axe and getting a bullseye (I was proud to get that footage).